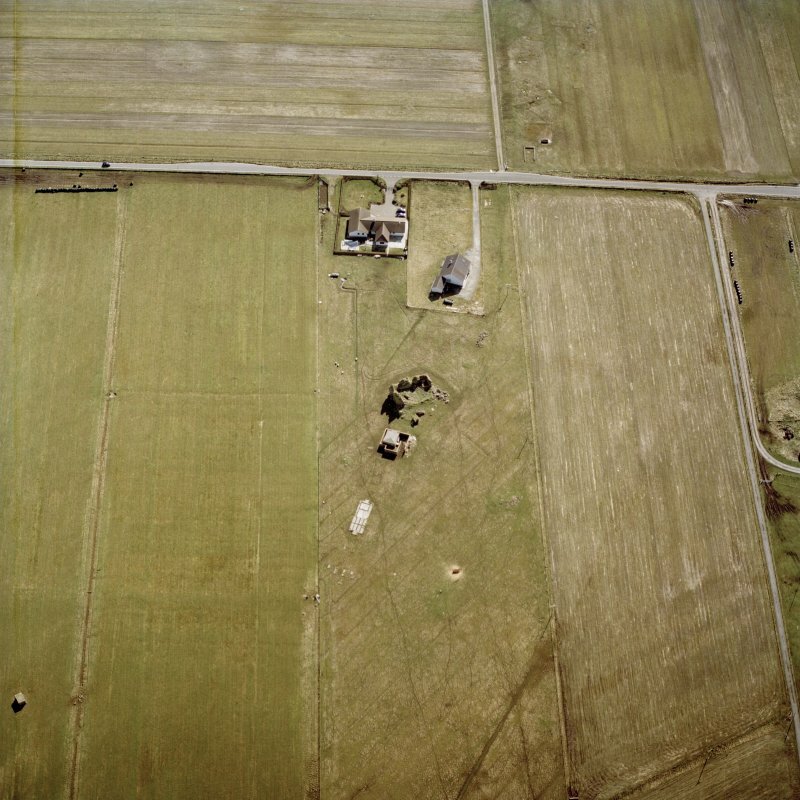 Oblique aerial view centred on the remains of the castle with the remains of the radar station adjacent, taken from the E.
Oblique aerial view centred on the remains of the castle with the remains of the radar station adjacent, taken from the SE. General view of Borve Castle. 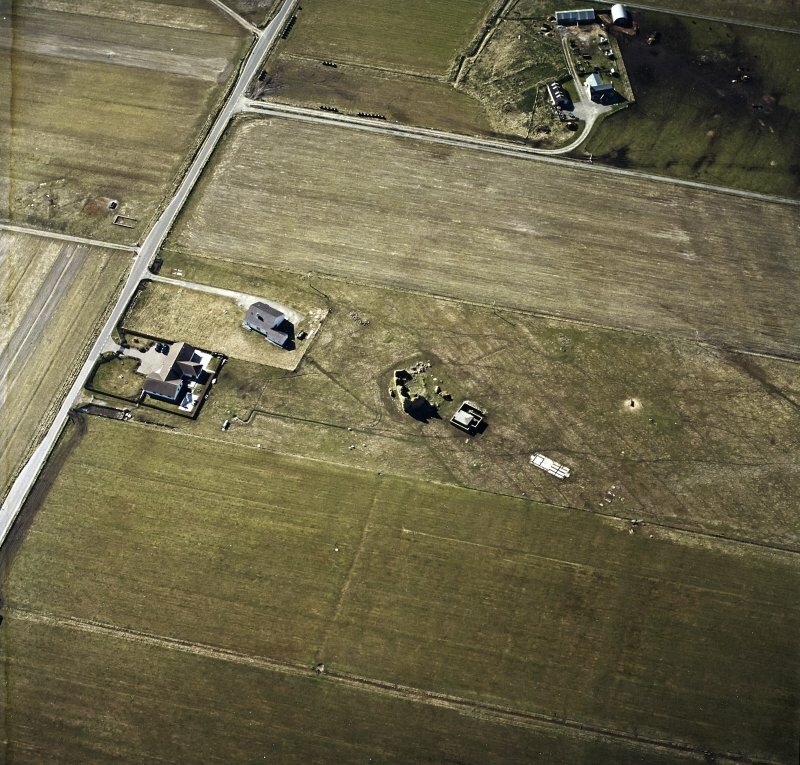 Oblique aerial view centred on the remains of the castle with the remains of the radar station adjacent, taken from the NW. 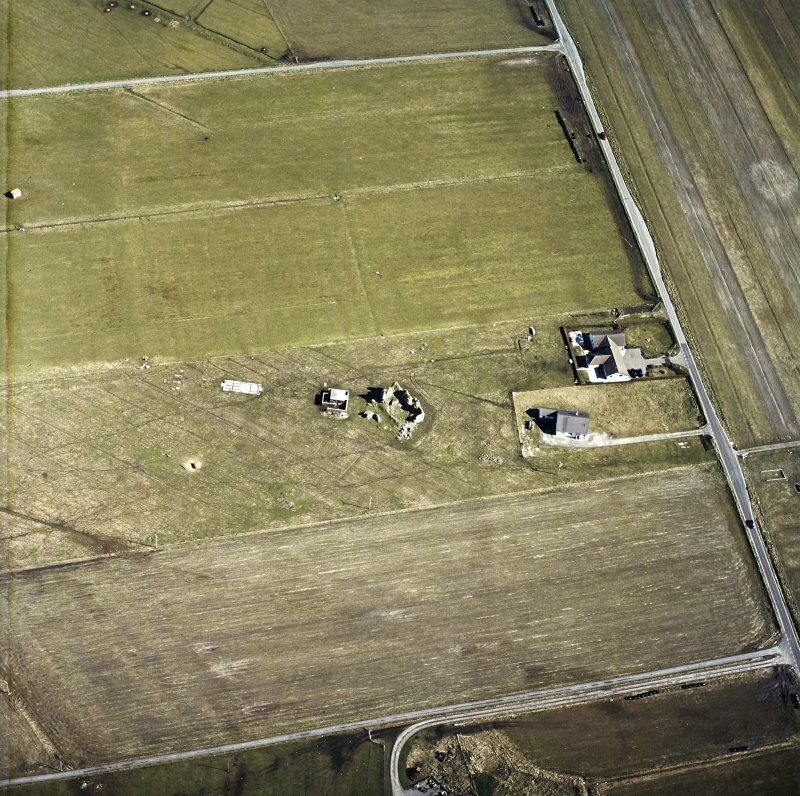 Oblique aerial view centred on the remains of the castle with the remains of the radar station adjacent, taken from the SSE. 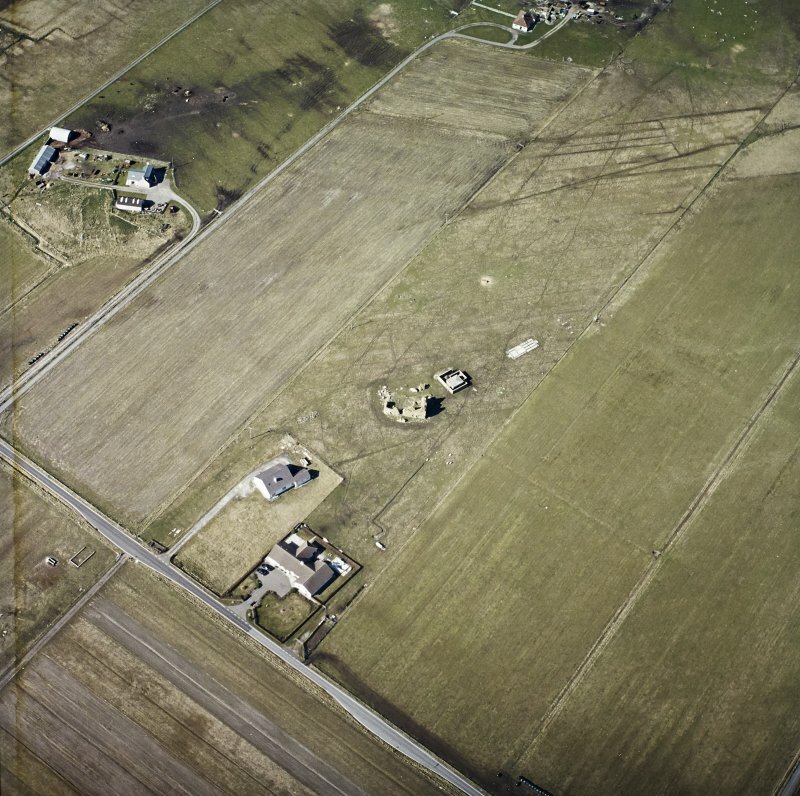 Oblique aerial view centred on the remains of the castle with the remains of the radar station adjacent, taken from the NE. Borve Castle, mid-14 th century Large, oblong tower-house with attached ranges, thought to have been built between 1344 and 13 63 by Amy MacRuari, and if so making an interesting comparison with Castle Tioram. The lichened lump of mortared rubble is the ruin of a massively thick, three-storey structure, with an entrance in the south wall. 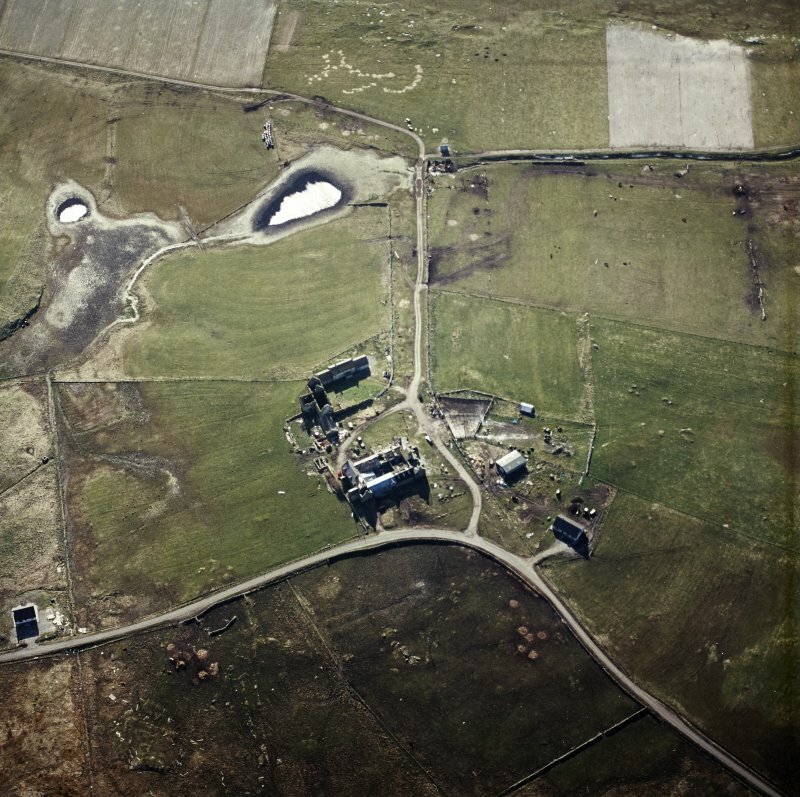 A former stronghold of the Macdonalds of Benbecula, Borve was occupied until at least the earlier 17th century. It was surveyed by Rev. 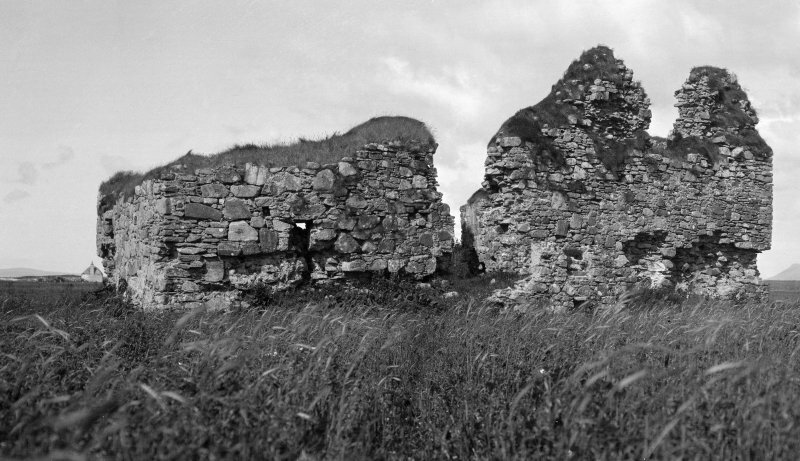 Aeneas Macdonald in 1913 , when the south and east walls stood to three storeys and it had "a vaulted chamber in the west wall and another in the north wall". 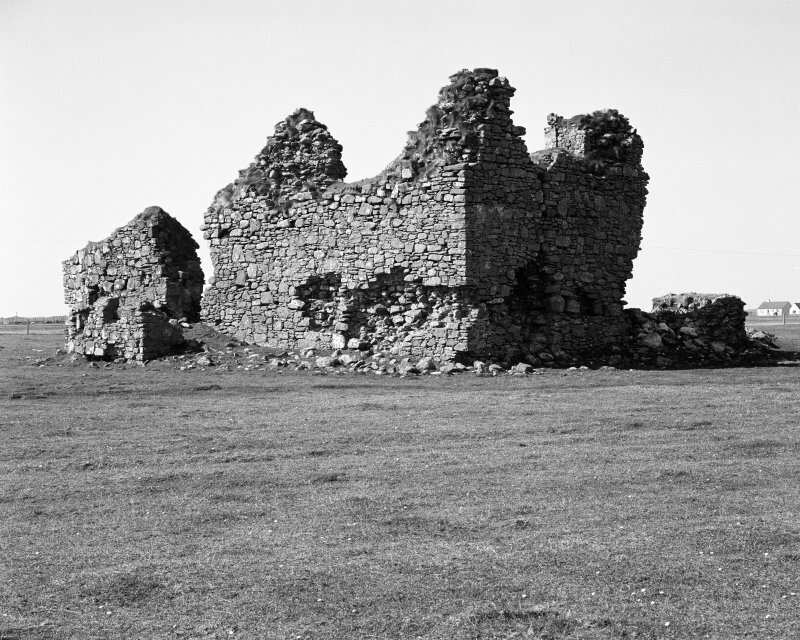 Borve Castle, Benbecula. The ruins of an oblong tower, 60ft by 36 1/2ft over walls 5 to 9ft thick, stand to 30ft high, indicating at least three storeys. The entrance is in the south wall, 6ft above the ground. NSA (1845) states "there is no tradition in regard to the time or person by whom it was built," but MacGibbon and Ross attribute it to Lady Amie, wife of John of Isla, in the latter half of the 14th century. New Statistical Account (NSA, R Maclean) 1845; D MacGibbon and T Ross 1889; RCAHMS 1928. The remains of Borve Castle are generally as described above; the E, W and S walls stand to the height mentioned but the N wall is reduced to a rubble bank scarcely 1.0m high. Visited by OS (J T T) 25 May 1965. Borve Castle is of at least three periods, the building sequence being, the erection of a nearly square tower to the E, the addition to this on the W of a smaller building of the same width, and the thickening of both the original E gable and later W gable to the interior, presubaly as floor scarcements. No sign of vaulting is visible in either section. The walls are so fragmentary as to make dating difficult, although the 14th century date assigned to the whole is parfectly possible. The E portion could be even earlier. H B Millar and J Kirkhope 1965d. NF 7733 5050 A desk-based survey and non-invasive site assessment was made of the ruin, in association with Simpson & Brown Architects. 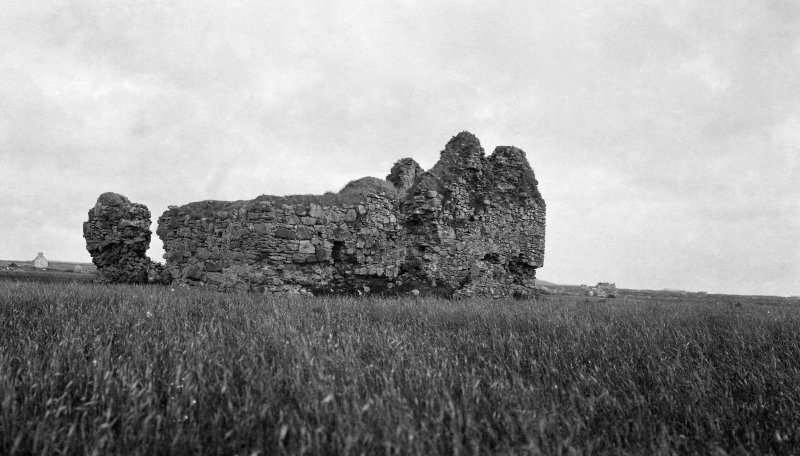 Situated on the machair 2 miles north-west of Creagorry are the remains of Borve Castle, an oblong tower measuring 60 feet by 36 1/2 feet over walls varying from 5 to 9 feet in thickness, which are still almost 30 feet in height and indicate that there were at least three storeys. The masonry is rubble heavily bedded in tenacious mortar. The walls are not homogeneous, but have been built in two skins; the inner, which was built first, 2 1/2 feet thick. The entrance is in the south wall, is 4 feet wide and has been barred; west of it is a small window. 1 New Stat. Acct., xiv., p. 188. 2 Cf. Clan Donald, iii., pp. 346, 348, 370. Visited by RCAHMS 26 July 1924. NF 7700 5001 (1km square centred on) A desk-based assessment and walkover survey were carried out between 2004 and 2009 in order to identify archaeological features on Borve machair and Rudha na Sithean, and to establish if these sites merited further investigation. The majority of the sites identified have produced pottery sherds that are typical of Iron Age settlement in the Western Isles, but a sherd of Norse platter ware has also been recovered. The sites are currently being damaged by ploughing and rabbits. Borve Machair The survey area included two scheduled ancient monuments; a medieval hall-house (Borve Castle, NF75SE 12), and a medieval chapel overlying an earlier settlement mound (Teampull Bhuirgh, NF75SE 13). 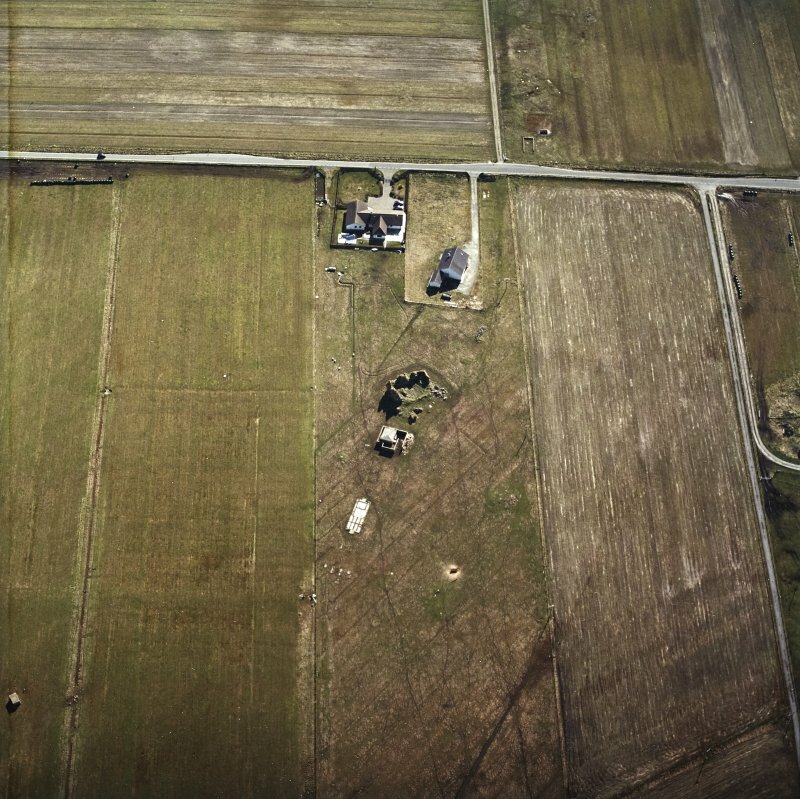 The survey identified a further 13 mounds, the largest c100m across. Rudha na Sithean The survey area included two scheduled ancient monuments; a cairn with a cist (NF74NE 12), and a settlement mound listed as a souterrain (NF74NE 10). 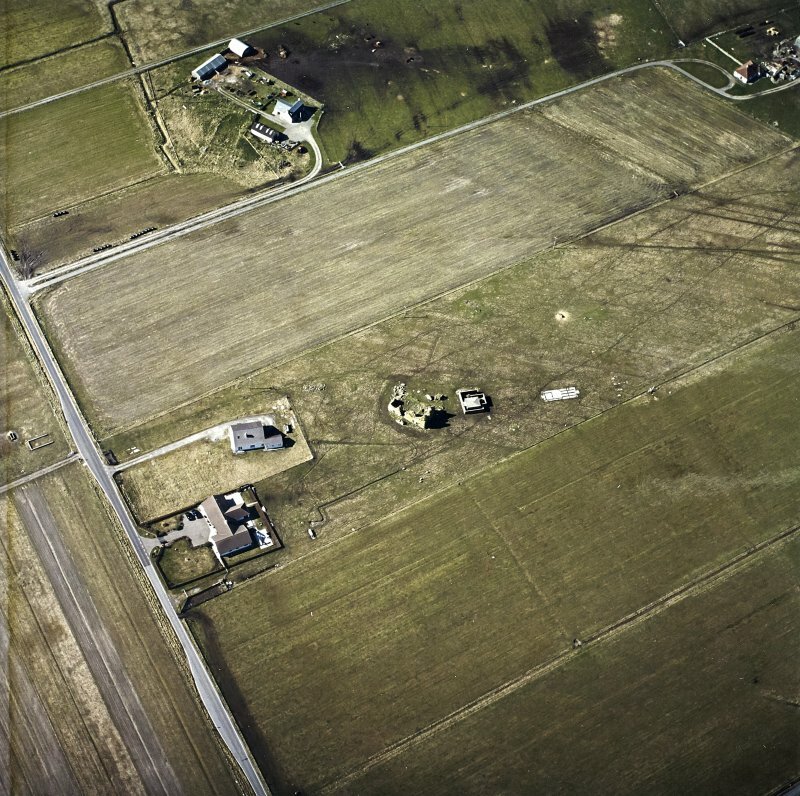 The settlement mound is set within a rectangular stone-walled enclosure (52 x 38m). Approximately 70m to the SW, a distinct cropmark is visible on satellite images taken in September 2004. The cropmark consists of a rectangular structure, 35 x 17m with rounded corners. The structure is not visible on the ground. Two other large mounds are visible in this area. The survey also identified intertidal peat deposits on the foreshore. The peat had been exposed by coastal erosion and contained preserved wood.